This offering is currently at capacity. Please call the office t be added to the wait list. Next welcomes highly sought after instructor Susan Fraser to teach two very different beading classes. Sue has been making and designing jewelry for 15 years, exhibited at events throughout Michigan and is a member of the Great Lakes Beadworkers Guild. Finished samples of each piece of jewelry is on display in the Next lobby. 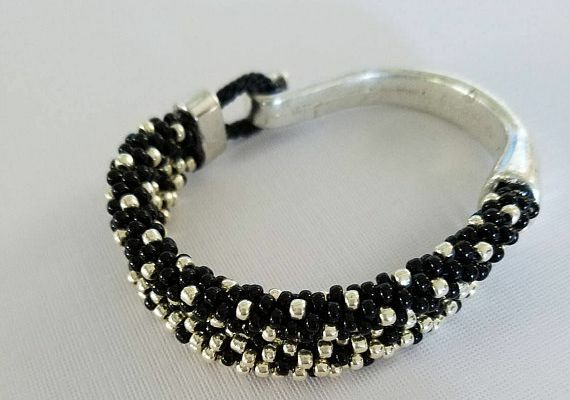 Class One: Quick & Simple Designs Friday, March 16 from 10:00 am to 12:00 noon Learn to create a charming memory wire bracelet that is light, easy to put on and comfortable to wear and a leather adjustable cord beaded necklace in this 2 hour class. There will be a choice of bead colors and charms and all supplies will be provided in the kit fee of $15. You’ll leave class with 2 ﬁ nished jewelry pieces and know-how! Class Two: Kumihimo Half Cuff Bracelet Friday, April 20 from 10:00 am to 12:00 noon Remember those camp days when you wove a lanyard? Here is a chance to put those skills to work. Learn to weave a beaded cord on a Kumihimo disk and then attach a metal ﬁ nding to create a beautiful half cuff bracelet. All supplies are included in the kit fee of $20 and you have the loom to take home for creating other treasures.